The rumor says that Normal distribution is everything. If $X$ and $Y$ are univariate Normal random variables, will $X+Y$ also be Normal? Then I’m wrong, and that’s why I want to write this blog. 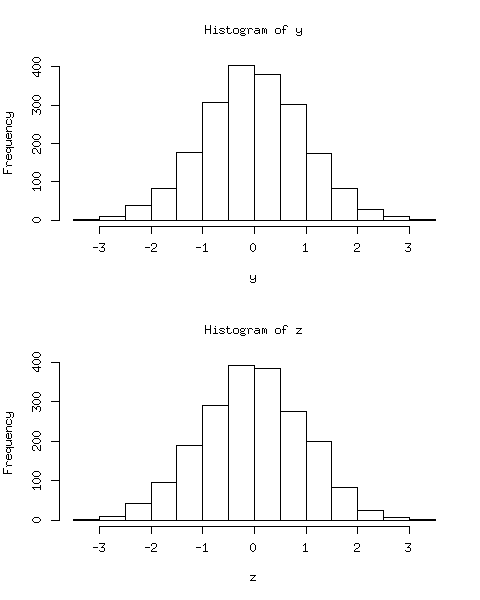 Then it can be shown that $Z$ has a normal distribution, while $Y+Z$ is not. Here I will not put any analytical proof, but use some descriptive graphs to show this. Below is the R code to do the simulation. 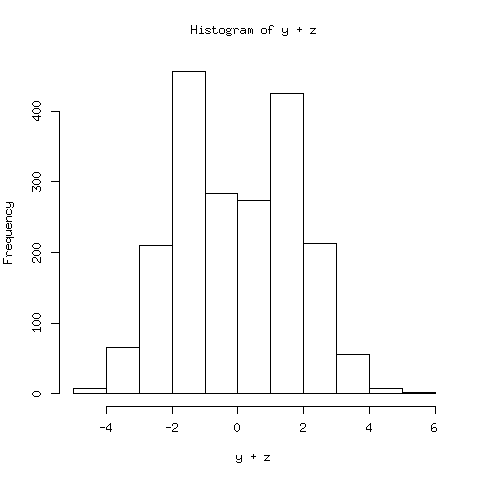 We obtain the random numbers of $X,Y$ and $Z$, and then use histograms to show their distributions. The result is clear: Both $Y$ and $Z$ should be Normal, but $Y+Z$ has a two-mode distribution, which is obviously non-Normal. If $X$ follows a multivariate Normal distribution, then any linear combination of the elements of $X$ also follows a Normal distribution. In our example, we can prove that the joint distribution of $(Y,Z)$ is not bivariate Normal, although the marginal distributions are Normal indeed. Then you may wonder how to construct more examples like this, that is, $Y,Z$ are both $N(0,1)$ random variabels, but $(Y,Z)$ is not a bivariate Normal. This is an interesting question, and in fact, it’s much related to the Copula model. Here I only give some specific examples, while the details about Copula model may be provided in future posts. and use $\Phi(y)$ to denote the c.d.f. of $N(0,1)$ distribution, then $C_1(\Phi(y),\Phi(z))$, $C_2(\Phi(y),\Phi(z))$ and $C_3(\Phi(y),\Phi(z))$ are all joint distribution functions that satisfy 1) not bivariate Normal and 2) marginal distributions are $N(0,1)$.